Quantum Vibe: Venus 23 On Sales Now! 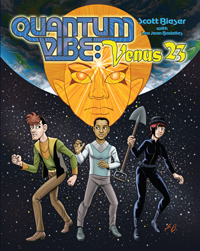 Exciting news boys and girls, the 310 strips of Quantum Vibe: Venus 23 have been collected into a fourth Quantum Vibe volume from Big Head Press and is on sale now from various online retailers. Venus 23 is the story of life on a small backwater planet, 500 years after the invention of the Murphy Drive. "Zytemonde" is a well managed, orderly, and predictable world where all needs are provided for by powerful android rulers. But life is hardly paradise when managing resources also includes controlling every aspect of everyone's life. And despite best efforts by their android rulers, a slow decay of civil society is beginning to show; with growing black markets, supply shortages, and power outages becoming more common. Yet, while the rot slowly breaks their world down, an unexpected question begins to be seen, asked on posters littered about the city and spray painted on walls: "Hu Iz Alyss Roaz?" Learn the answer to this question along with young Bolivar Eustace Clark ("Bok") and his friends, as they struggle to survive on a world designed to end all struggle. Order your copy today. Quantum Vibe: Venus 23 is available in print as well as digital form.